A fragrant dish which will your taste buds on a culinary adventure. 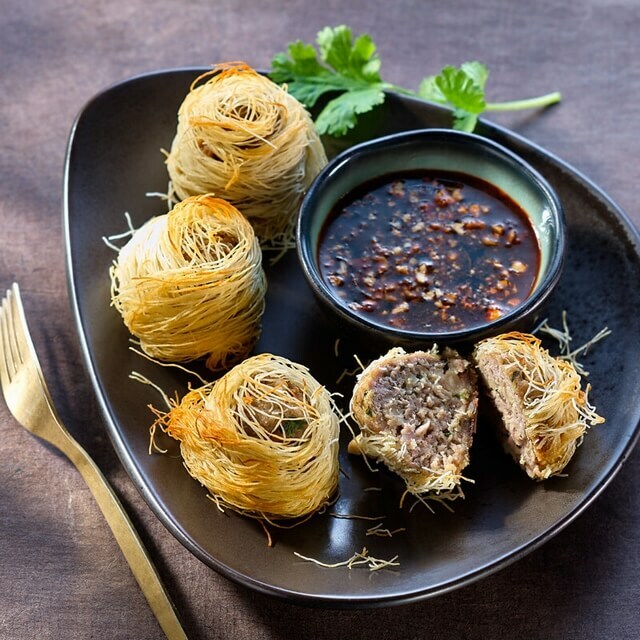 Carefully unroll the kadaif vermicelli, cut into 8 squares, place them flat on a board, brush with melted duck fat and put in the fridge. Heat the oil in a frying pan, add the strips of duck and salt and pepper until they are cooked how you want them and then deglaze with honey. Remove from the heat and leave to cool. Coarsely chop the cashew nuts and finely chop the coriander. Cut the duck strips into large pieces, put them in the bowl of a mixer and chop for a few seconds. Put the mince in a bowl with the chopped garlic clove, the coriander, the egg and two-thirds of the cashew nuts. Season with salt and pepper, mix. Heat the oven to gas mark 6 (180°C). 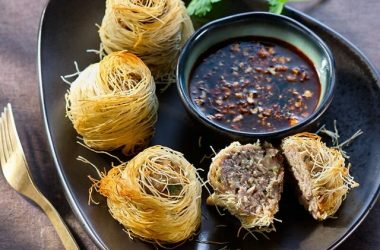 Take the squares of kadaif from the fridge, put them greased side down on the board, place a large spoonful of stuffing in the centre of each one and close them by forming a ball. Place the balls on a baking tray, bake in the oven for 10 to 12 minutes until they are golden-brown. Pour the soy sauce, vinegar and a tablespoon of water to dilute the green curry paste into a bowl and add the remaining chopped cashew nuts. Serve the dumplings with the sauce. Next recipe Design your own sweets!